The 2002 CJI Judicial Excellence Award was presented to the Honorable T. Peter Craven of the Ninth District Court, Glenwood Springs. Hon. T. Peter Craven of the Ninth Judicial District Court in Glenwood Springs has been selected as the 2002 recipient of the Colorado Judicial Institute's Judicial Excellence Award. First appointed to the court in 1991, Judge Craven has handled all types of cases in Garfield, Pitkin and Rio Blanco counties. He also serves as a water judge. Prior to his judicial appointment, he maintained a distinguished career as a trial lawyer in Glenwood Springs and Denver, served as Glenwood Springs' city attorney, and as the Ninth Judicial District's first public defender. 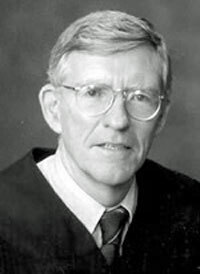 Judge Craven's contributions to the Ninth Judicial District include initiating, creating, and presiding over a drug court for Garfield County. In an effort to make the court system more understandable for Spanish speaking litigants and to improve access to the courts for people who speak Spanish, he traveled to Mexico to learn about the Mexican legal system and has studied Spanish. He has also developed differentiated case management principles for mental health cases in Garfield County. Judge Craven has been active in teaching courses in continuing legal education for special advocates for children and in family law. Judge Craven is well known for his scholarly, thorough, and patient approach to trying cases, and for his willingness to take on cases for other judges. Judge Thomas Ossola, chief judge of the Ninth Judicial District, praises Craven for his ability to administer his docket in a just and timely fashion and for his role as a leader in judicial reform. A law graduate of the University of Michigan, Judge Craven serves on the Colorado Supreme Court Civil Rules Committee, Gender Justice Committee, and Probation Advisory Committee. He has also been chair of the bench-bar committees in Garfield and Pitkin counties, and is responsible for a summer intern program.